A financial crisis threatens the Health Care Access Fund (HCAF), one of the primary revenue sources for Medical Assistance in Minnesota. Recent federal decisions led to cuts in MinnesotaCare funding, and subsequent lawsuits brought the financial status of MinnesotaCare into the public eye. But Minnesota has a larger problem ahead, as the primary revenue generator for the HCAF will sunset in the near future. When MinnesotaCare began in 1992, Minnesota primarily financed the program through the HCAF with a 2% gross revenue tax on providers. The federal government slowly covered more of the costs of MinnesotaCare over the past 26 years; in 2014, the Department of Health and Human Services (HHS) accepted Minnesota’s Basic Health Plan (BHP) waiver. Since 2014, the federal government covered almost 100% of the costs of MinnesotaCare, which freed up HCAF resources for other programs—mainly Medical Assistance. However, the provider tax will sunset by 2020, and thousands of Minnesotans could lose some of their benefits, particularly those who have long-term health care needs. It could be prudent to reexamine the role of the provider tax to protect the Health Care Access Fund from an outcome no Minnesotan desires. When Governor Arne Carlson signed MinnesotaCare into law in 1992, a 2% provider tax and a 1% tax on the premiums of health maintenance organizations (HMOs) funded nearly the entire program. In 1995, Minnesota successfully applied for a Medicaid waiver that covered approximately 13% of the overall costs of MinnesotaCare. By 2002, the Medicaid waiver grew to cover a third of the costs of MinnesotaCare, while the HCAF covered the rest. The HCAF provider tax continued to finance a portion of MinnesotaCare through 2013, when a provision in the Affordable Care Act (ACA) allowed Minnesota to shift MinnesotaCare costs almost entirely onto the federal government in 2014. The ACA allows states to establish Basic Health Plans—state administered programs that provide health insurance to people who make too much money to apply for Medicaid but still cannot afford health insurance on the private market. Only two states created BHPs, Minnesota and New York. Minnesota receives 95% of the tax credits and cost-sharing reduction payments (CSRs) that would have subsidized the costs for MinnesotaCare recipients. In 2017, federal funds and enrollee premiums covered 97% of the costs of MinnesotaCare, and the HCAF covered the rest. Today, MinnesotaCare provides 90,000 Minnesotans with low incomes—for example, a family of four that earns $34,000 to $49,000 annually—with comprehensive health insurance that costs between $0 and $80 a month but costs the state a pittance. With nearly all of MinnesotaCare financed by the federal government, the primary expenditure of the HCAF is payments for Medical Assistance. In 2017 the HCAF spent $241 million on Medical Assistance, with all other expenses (including MinnesotaCare) totaling $125 million. Medical Assistance covered 14% of Minnesotans in 2015; it covered approximately 25% of Minnesotan children, and half of nursing home residents and people with disabilities. In terms of specific services, 35% of Medical Assistance spending paid for long-term care, and 44% paid for managed care. The HCAF appropriations fund the Department of Human Services and the Department of Health, as well as help fund a provider training program at the University of Minnesota. If the provider tax only paid for MinnesotaCare, then Minnesota could sunset the 2% provider tax without consequence. However, thousands of Minnesotans rely on the services that the HCAF pays for, and the loss of the HCAF would significantly harm people with long-term health care needs. The consequences could be quite catastrophic as early as 2022. 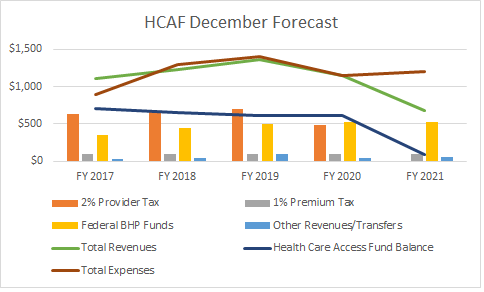 A December 2017 forecast factored in the state’s reinsurance payments, a shift of Medical Assistance costs to the HCAF, the termination of the provider tax, and the loss of federal BHP funds. This forecast* projected the HCAF to run a small annual deficit as soon as this year; that deficit will balloon to $523 million in 2021. If HCAF-funded programs continue current spending, the HCAF will run out of money by 2022. A renewal of the provider tax would eliminate any peril to the HCAF, and it would protect the thousands of Minnesotans that rely on the HCAF to fund Medical Assistance.